What we are sharing with you below represents our present understanding of the prophecies of Daniel and Revelation. Father Yahuwah has been leading us us in baby steps to where we stand today. We are eternally indebted to the guidance of His Spirit, for in gaining a clearer understanding of end time prophecies, we gain indescribable encouragement that will help us endure the tribulation and hardships that await the righteous in these last days of earth’s history. Many of us will be martyred in the very near future for standing up for Yahuwah’s present truth. What better way to prepare for whatever is ordained for us by the Father than to be armed with a deeper understanding of His end time prophecies? We have unpublished content that contained what we today regard as an inaccurate understanding of the 7 seals. Today, we know with growing confidence that the book with the 7 seals contains all the predicted events that were shown to John the Revelator in a chronological order from the time of John till the end of time. Of the 3 things that John was commanded to write about, the "things which shall be hereafter" represent the primary focus of the book of Revelation; they occupy chapters 6-22. All of these predicted future events from the time of John till the end are inked in the book of the 7 seals. By so doing, the Father is assuring the righteous throughout history that nothing will ever unfold in this world that was not pre-ordained by Him for a purpose. Once the righteous grasp this eternal truth, there is nothing that will ever alarm or overwhelm them. All foretold events have been pre-engineered by the Father, thus confirming His full control over the affairs of our world. As events unfold, we will be marking the check box for that event. We invite you to keep visiting this resource. And if a better understanding is achieved regarding certain events, we will update the page accordingly. As you will readily see, the first 5 seals have been broken already, and now we prayerfully and eagerly await the breaking of the 6th seal at any moment. Sun becomes "black as sackcloth of hair." Stars fall on earth, "even as a fig tree casteth her untimely figs, when she is shaken of a mighty wind." Solid firmament opens up as a rolled scroll. Righteous see Father & Son seated on their thrones. "Voices, and thunders, and lightnings"
 1st Seal: Opened already - The white horse points to the rise of the papal system, when the bishop of Rome declared himself to be Yahushua’s representative in this world, and rode a white horse just as Yahushua is depicted doing in Rev. 19:11-16, and went on to conquer the whole world. 2nd Seal: Opened already - The red horse points to the evolvement of the papal system into a bloody and persecuting power of Yahuwah's people, a far cry from the teachings and life of Yahushua. 3rd Seal: Opened already - The black horse points to the rise of the Society of Jesus [the Jesuits] with the their [Jesuit Superior] General always wearing black robe. It is worth noting how the Father does not gloss over the development of this evil order, which played a pivotal role in the killing of millions of Yahuwah’s righteous followers during the Middle Ages. 4th Seal: Opened already - This pale-colored horse points to the joining of the papal system with the Jesuit killing machine. When you mix white with black, you get a pale color, grayish. When these 2 systems joined forces, they created the most dreadful persecuting power in history. 5th Seal: Opened already - The joining of the papal system with the Jesuits led to the death of millions of Christian martyrs and the 5th seal is dedicated to their mention. 6th Seal - At any moment now, the 6th seal will be opened. Let us remain vigilant and watchful. Read carefully the events that will unfold under the 6th seal, as recorded in Rev. 6:12-17. A "great earthquake" - We will know that the 6th seal has been opened when a ''great earthquake'' hits the earth. It will not be like any past earthquake. Last year, for instance, there were over 12,000 earthquakes that registered above 4 on the Richter scale. This earthquake will not be comparable to any past earthquake. It will stand out as the most destructive earthquake in history up to that moment. Sun becomes "black as sackcloth of hair." - We are not told the timing of this event, but we expect that it will occur shortly after the ''great earthquake'' for maximum impact on humans. Stars fall on earth, "even as a fig tree casteth her untimely figs, when she is shaken of a mighty wind." - We expect that the event of the falling stars will cause considerable damage and result in the death of many people. Solid firmament opens up as a rolled scroll. - ''And every mountain and island were moved out of their places'' revealing Father Yahuwah seated on His Heavenly throne, and standing next to Him our Savior, Yahushua. While this scene will be the most frightening scene ever experienced by wicked humans since the flood, it will be a most glorious event for the living righteous. The great anticipation amongst the righteous for this event can’t be overstated. The timing of the sighting of the Father and Son by the righteous as the last event under the 6th seal will galvanize and transform them in ways that cannot be captured by words. When the righteous will fill their eyes with real life images of the Father and Son, they will instantly acquire divine strength to endure the calamities of the trumpets, the persecution of the beast, and be ready for martyrdom if permitted by the Father. Stephen was oblivious to his own stoning when he ''looked up steadfastly into heaven, and saw the glory of Yahuwah, and Yahushua standing on the right hand of Yahuwah'' (Acts 7:55). The righteous today will very soon experience their moment of ''looking up steadfastly into heaven'' and filling their eyes with the joy of seeing the Father and Yahushua. This event could be only months away; may we be ever ready for it. Righteous see Father & Son seated on their thrones. - This is that glorious event that the righteous need to earnestly pray to be found fit to witness. Emergence of the 2 prophets/witnesses ministering in sackcloth - We think they will play an important role in announcing the trumpets. And since their 1,260 day long ministry will end before the 7th trumpet is blasted, it is very reasonable to conclude that they may emerge shortly after the end of 6th seal or shortly after the opening of the 7th seal to announce the trumpets and to call sinners to repentance, as they announce the eminent close of probation for the human race. The message will be most unwelcomed by all people. Sealing of 144,000 - ''And I saw another angel ascending from the east, having the seal of the living Elohim: and he cried with a loud voice to the four angels, to whom it was given to hurt the earth and the sea, Saying, Hurt not the earth, neither the sea, nor the trees, till we have sealed the servants of our Elohim in their foreheads'' (Rev 7:2-3). The 7th seal will open shortly after the sealing of the 144,000, who will be translated to Heaven without seeing death. NOW is the time to strive to be amongst the 144,000. 7th Seal - The fact that the 6th seal was shortly followed by the 7th seal is proof positive that the events of the 6th seal do not point to the Second Coming of Yahushua as WLC once believed and as most of Christendom believes today. "thunderings, and lightnings, and an earthquake" (Rev. 8:5), when the angel casts the censer into the earth - As it was with the 6th seal, the 7th seal also will be signaled by an earthquake. However, this earthquake will not be as destructive as it was the case in the 6th seal. This earthquake will instead be accompanied with voices, thunder, and lightning. 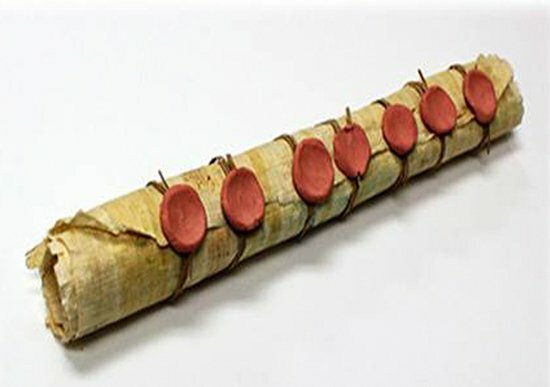 1st Trumpet - ''And the first messenger did sound, and there came hail and fire, mingled with blood, and it was cast to the land, and the third of the trees was burnt up, and all the green grass was burnt up'' (Rev. 8:7). We leave it to the reader to visualize the state of panic that will grip the inhabitants of this world as a result of this first trumpet alone. 2nd Trumpet - ''And the second messenger did sound, and as it were a great mountain with fire burning was cast into the sea, and the third of the sea became blood, and die did the third of the creatures that [are] in the sea, those having life, and the third of the ships were destroyed'' (Rev. 8:8-9). Will there be any meaningful shipping after this trumpet? Can you visualize the state of the world economy when shipping comes to a grinding halt? 3rd Trumpet - ''And the third messenger did sound, and there fell out of the heaven a great star, burning as a lamp, and it did fall upon the third of the rivers, and upon the fountains of waters, and the name of the star is called Wormwood, and the third of the waters doth become wormwood, and many of the men did die of the waters, because they were made bitter'' (Rev. 8:10-11). How will the health cares of all countries fare with the consequences of this trumpet? 4th Trumpet - ''And the fourth messenger did sound, and smitten was the third of the sun, and the third of the moon, and the third of the stars, that darkened may be the third of them, and that the day may not shine -- the third of it, and the night in like manner'' (Rev. 8:12). The asteroids striking earth will result in tons of dust and particulates being ejected into the sky. Damage to tectonic plates may well result in increased volcanic activity. Consequently, this fourth trumpet declares that the sun, moon, and stars will be darkened significantly. 5th Trumpet [1st Woe] - The details for the 1st woe are recorded in Rev 9:1-12. In this woe, Satan will be given the key to the bottomless pit, and will be permitted to release his imprisoned fallen angels which will be allowed to torment the unrepentant for 150 days. They will fake an alien invasion so that people’s anger will not be directed at Satan. We have concluded that the sole purpose of this ''alien invasion'' is to elevate the status of Satan’s representative on earth, i.e. the pope, so that the pope can carry out Satan’s war against the righteous. This woe will last exactly 150 days, and the sealed righteous ones will be protected from the pain that will be inflicted by Satan’s fallen angles on the unrepentant, which is likened to the sting of scorpions. Credit for ending this false alien invasion will be given to the pope and thus, he will be able to enforce on the world Sunday worship. Set up of "abomination of desolation" & start of 1,260 days - Credited with ending the dreadful and exceedingly painful ''alien invasion,'' the pope will be in a position to unite the whole world in upholding of Sunday as a day of rest and renewal. World leaders will be eager to surrender their power and lend their unconditional support to whatever the pope proposes, to help ensure against another alien invasion. The count of the 1,260 days period will commence when the whole world adopts Sunday as a no-work day. The 2 witnesses along with the faithful ones will warn the world against the exaltation of Sunday, Rome’s historic mark of authority. The opposition of the 2 witnesses and the faithful to Sunday exaltation will result in increased hatred and persecution of His faithful. But His faithful will not be shaken and many during this 1,260-day period (especially towards the end of this period) will pay the ultimate price in defense of His true Sabbath day of worship. Impersonation of Yahushua by Satan - We are not told when the impersonation of Yahushua by Satan will take place. We can only speculate that for maximum deceit and impact, it will take place just prior to the close of human probation. This is why we have placed this event between the 1st and 2nd woe. Death, resurrection, and ascension of 2 prophets/witnesses - It is important to note the following: The 2 witnesses will testify to His truth for a period of 1,260 days. It will also be 1,260 days from the time the ''abomination of desolation'' is set up till the close of probation. Although equal in length, the starting point for the ministry of the 2 witnesses will commence earlier than the starting point of the ''abomination of desolation.'' This is most important to remember and take into account. This means that the ministry of the 2 witnesses should end before close of probation, i.e. before the 1,260-day period allotted to the ''abomination of desolation.'' The beast [Pope Francis] will wage a relentless war against the 2 witnesses. But no harm will come to them until the end of their 1,260 ministry, when the Father will permit the killing of these 2 faithful witnesses. Their bodies will be brought to St. Peter's Square at the Vatican, to celebrate their death ''because these two prophets tormented them that dwelt on the earth'' (Rev. 11:10). But after 3.5 days of displaying their dead bodies, they will be raised up from death and taken up to Heaven in a site that will terrify all who came to celebrate their death. The same cameras and reporters who were covering the celebration of their death will capture and cover their resurrection and ascension. Earthquake hits 1/10 of Vatican & swallows 7,000 celebrators - Shortly after the ascension of the 2 witnesses, an earthquake will hit St. Peter’s Square swallowing 7,000 celebrators. 6th Trumpet - The 2nd woe will take place just before the end of the 1,260 days allotted to the ''abomination of desolation.'' The reason that we believe it will take place shortly before the close of probation and the end of the abomination of desolation period is because it is the woe in which Yahuwah will permit Satan’s fallen angels to kill 1/3 of the remaining wicked. As we approach the close of probation, it is sensible to conclude that most living humans will have made up their minds. And since the wicked will continue in their wickedness, it is not surprising that the Father will permit Satan to destroy 1/3 of them at a specific hour, day, and year. In other words, every event recorded in the 7-sealed book unfolds at a specific appointed time and it is Yahuwah that not only specifies every event, but also chooses the timing for every event. Start of 45 days of glorification of saints - We know saints will be celebrated in Heaven by the Father, the Son, and all the holy angels upon their ascension to Heaven. However, it is the Father’s plan that the saints be glorified, by the very wicked people who persecuted and martyred them during the 1,260 days of persecution. While remaining world leaders go about tormenting the beast, thus fulfilling Yahushua’s words - ''And the ten horns [alive world leaders] which thou sawest upon the beast, these shall hate the whore [the papacy], and shall make her desolate and naked, and shall eat her flesh, and burn her with fire'' (Rev. 17:16) - these world leaders who were deceived by the beast and are desolating the papal system will also honor the resurrected saints and the 144,000 for their faithfulness for 45 days. As to how we arrive at the 45 days count for the glorification period, it is by going back to Daniel 12. "And from the time that the daily sacrifice shall be taken away, and the abomination that maketh desolate set up, there shall be a thousand two hundred and ninety days. Blessed is he that waiteth, and cometh to the thousand three hundred and five and thirty days" Daniel 12:11-12. The 1290 literal days refer to the time when period in which the 'the abomination that taketh desolate' will reign. We know from Revelation 11 that 'the holy city shall they tread under foot forty and two months'. This is when the 'abomination that maketh desolate' and will last for 42 months or 1260 days. Daniel 12 also confirms in verse 7 the same length of period ' it shall be for a time, times, and an half; and when he shall have accomplished to scatter the power of the holy people.' This is 3.5 years equal to 1260 day, or 42 months. We have to conclude that the difference between 1290 days and the 1260 days must be the time the Father has set for the pouring of the 7 last plagues. Daniel was told that the abomination of desolation will last 1290 days, and confirmed that His people will be scattered for a period of 1260 day, so the net difference of 30 days much indeed be the time set for the 7 last plagues. Yahuwah’s wrath will be manifest in 14 plagues. The first 7 are called trumpets, and they will be blasted while His door of mercy is still open. However, when the 7 last plagues are poured, the door of mercy will have closed for ever. The special resurrection of Daniel 12:2 - ''And many of them that sleep in the dust of the earth shall awake, some to everlasting life, and some to shame and everlasting contempt'' (Dan 12:2). This is not referring to the first resurrection. This is a reference to a resurrection in which some of the righteous will be raised up along with some of the wicked, simultaneously. In the first resurrection, only the righteous will be raised up by Yahushua’s voice. But in this special resurrection that will precede the Second Coming of Yahushua, some of the righteous and the wicked will be raised up to witness the Second Coming of our Master. John tells us the identity of the wicked ones who will be raised up before Christ’s return. ''Behold, he cometh with clouds; and every eye shall see him, and they also which pierced him'' (Rev. 1:7). How could those who pierced Christ witness His glorious return unless they were first raised from the dead in this special resurrection? What about the other group? So who are the righteous who will be raised up along side the wicked ones who participated in the crucifixion of our Master? We are not told in the Bible who they are. We speculate that the righteous who will be raised up at the beginning of the glorification period of 45 days may very well be the martyrs who died at the hand of the beast and the false prophet during the 1,260 days of papal persecution. In this way, they will not miss welcoming back their beloved Master Yahushua, for whom they paid the ultimate price in defense of His truth. They can along with their contemporary 144,000 welcome the return of Yahushua with open arms.